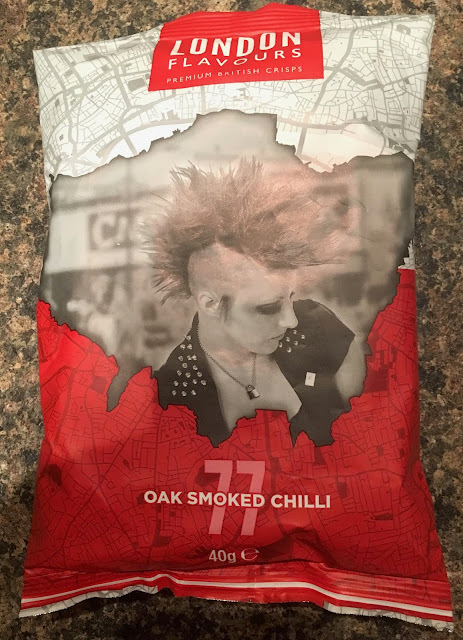 The packet of these Premium British London Flavours crisps talks about the colourful spiky haired punk era of 1977, and the producer’s homage with this Oak Smoked Chilli flavour. I was two years old in 1977 so that era passed me by a little. There was still some punk music around the charts in the early to mid-80s though, and I’ve certainly never minded listening to some of the old tracks. Made with 100% British potatoes these 77 Oak Smoked Chilli crisps sound a little too health conscience to be 1970s though; being gluten free, suitable for vegetarians and vegans (who I reckon were shunned around that time), free from artificial colours, flavours and preservatives, with no added MSG, and GMO free! The 40g packet contains 519 calories per 100g, with 28.8g of fat, 3.4g of sugar, and 1.9g of salt. 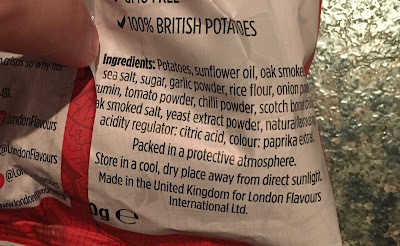 Please see photograph for ingredients.